Tell her you love her this Mother’s Day (May 10) with the gift of glowing, rejuvenated skin! We offer 6 types of remarkable facials. Vitalizing Eye Treatment Mask included! Hydrating Facial. 70 minutes. $60 (regular $120). Anti-Aging Facial. 90 minutes. $75 (regular $150). Oxygen Infusion Facial. 70 minutes. $60 (regular $120). Deep Exfoliation Facial. 90 minutes. $75 (regular $150). Sensitive Skin Facial. 70 minutes. $60 (regular $120). Combination Facial. 90 minutes. $75 (regular $150). Learn about our remarkable facials here. Plus, if you let us know in advance, we can also include a custom-printed Happy Mother’s Day card with her name on thick ivory cardstock with a pearlescent border. Available for purchase until May, 24 2015. Can be claimed at any future date without expiration! 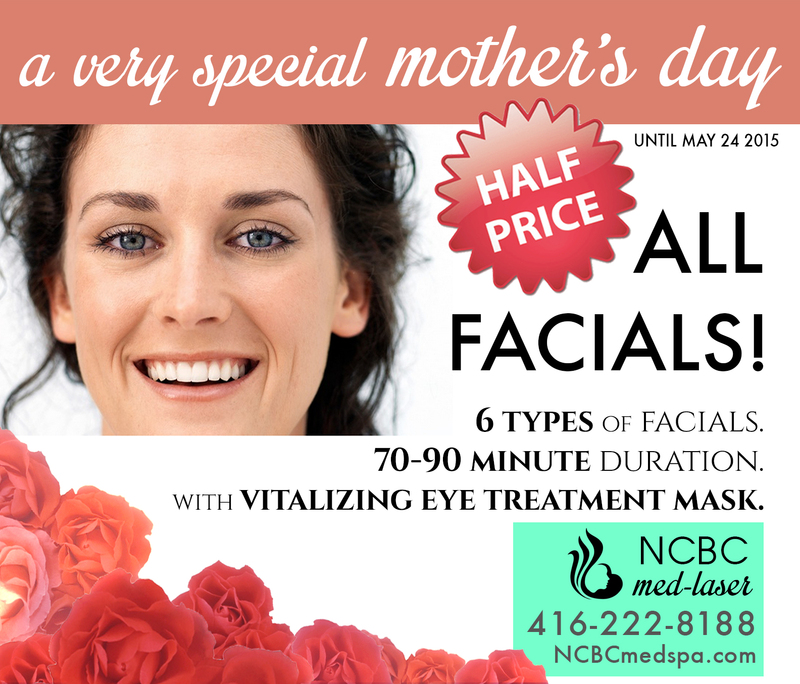 The perfect gift for any mother: a nourishing, hydrating, revitalizing facial at NCBC Med-Laser!